Happy New Year! To start off the New Year, I will be looking at the roles of Curra and Preziosilla from the opera La Forza del Destino by G. Verdi to perform with Center Stage Opera. The Current Projects link has been updated to reflect the new roles under study. There is also more exciting news on the way with my own professional development, please stay tuned for the official announcement! Have a wonderful beginning to 2017! Hello all! I have added two new videos to the media page; video recordings of American Art Songs “Another New Voice Teacher” by Andrew Thomas and “The Star” by Martha Hill Duncan. Click on the link for the media page to view the videos. I have also updated the performances page with the Faust performance dates. It turns out I will be performing the role of Marthe Schwerlein in Faust instead of only covering the role with Center Stage Opera. These are the dates but please note they may be subject to change due to casting/venue details: I will be performing on November 12th and 13th in the Philadelphia area, and November 18th and 20th in the Harrisburg area. Please check the attached poster for details on locations and times. 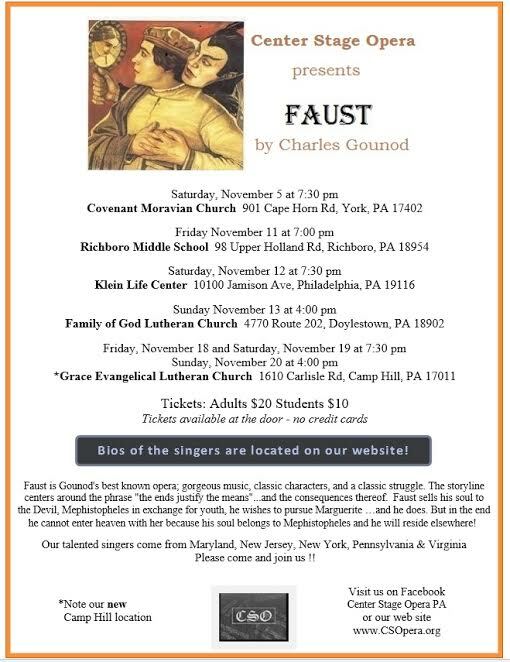 Please join us for our performances of Faust! Another school year has begun, and I am teaching Music 100 once again at Penn Highlands Community College! In addition to spending another great semester with Penn Highlands this fall, I will also be covering (understudying) a role with Center Stage Opera in New Cumberland, PA, in their upcoming production of the opera Faust by Charles Gounod. Please check out the Current Projects page for more information! I also updated my About page with an updated biography. What an exciting autumn ahead! Here is a recording from the premiere of the song cycle Anonymous Cabaret by Dr. Timothy Melbinger, premiered in April 2016. Its private life is a disgrace! They only mention it in hints. Two other recordings of pieces from the song cycle can be found on the media page. Enjoy! Annette Nagle is a classically trained musician currently living in central Pennsylvania. She is a pianist, a lyric coloratura mezzo-soprano and is an organist specializing in sacred music. Ms. Nagle will be attending Indiana University of Pennsylvania in fall of 2017, studying voice with Dr. Joseph Baunoch. Copyright © 2019 Annette Margaret Nagle. Proudly powered by WordPress. Blackoot design by Iceable Themes.